The cozy hotel at the Rhodope Mountain called Eco Hotel Zdravets is already more visible from a long distance thanks to the quality outdoor advertise. The channel letters have one of the best LED illumination system – G.O.Q. LED modules. Located close to second-largest city of Bulgaria – Plovdiv, Eco Hotel Zdravets has became a preferred destination. The hotel offers many different activities as skiing, horse riding, running all kinds of corporate events, team building, or just relaxing. It is an ideal destination during the summer and winter periods. The advertising channel letters are made of a high quality acrylic. The durable LED installation G.O.Q. LED ensures their long service life and high energy efficiency up to 85%. The illuminated lettering is mounted on the facade of the hotel. The light from the returns of the letters is blocked with 3M Blockout Film. It helps the lettering to light straight ahead. 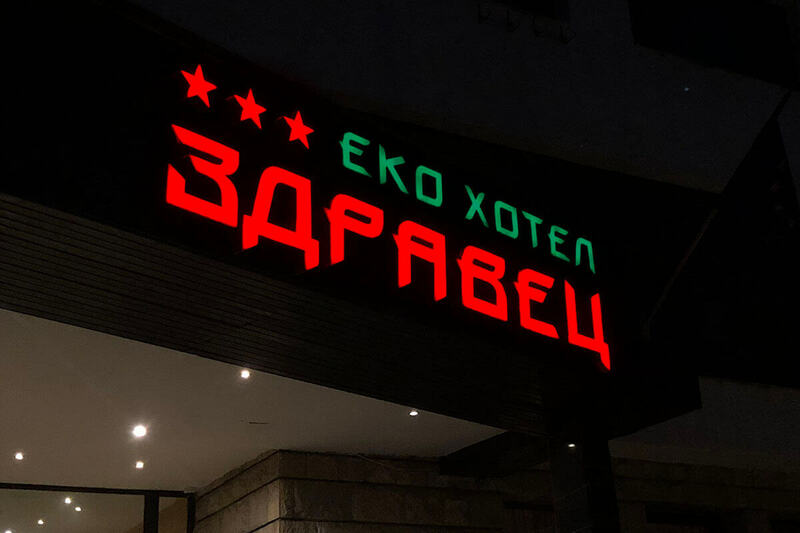 The acrylic channel letters have been illuminating Eco Hotel Zdravets for more than 10 years. It proves their quality and durability.